Or those who question will be dismissed as haters. Or they will be labeled as "persecutors" for the greatness that God is manifesting through the magnificent pastor. Or they will be dismissed because God is doing such great things that the leadership MUST be doing everything right. Or they will simply be pointed to the "scoreboard". Because the score is all that matters, right? We the people are the reason these guys get away with this.We buy this bill of goods they are selling and think we are serving the lord. Just how much more stupid can we get? Stop the money flow and this nonsense will cease. Guaranteed. "[P]astors made wealthy simply BECAUSE they are pastors. Pastors who view the church as a business - THEIR business - THEIR FAMILY business." In what other business can the owner or CEO shame or guilt-trip customers into giving him a tenth or more of their income EVERY WEEK by inducing fear of eternal damnation or poverty in this life - and invoking the name of God to back himself up? It is the closest thing to a money tree if there ever was one. Politics and the Clergy is the last resort of scoundrels. Excellent post and excellent comments! It all boils down to the people in the pews like it, and they'll keep giving their money. So outsiders can point and laugh and criticize all they want, and it won't matter. In fact, they'll become more loyal, because they'll see their beloved pastor as "attacked." I still have hope that a few eyes of thinker-types in these congregations will become opened. They may still enjoy attending these churches, but they'll cast a more skeptical eye on how things are done. Even the members he has came from other franchises. He is like a McDonald's taking customers from Burger King and Wendy's. Same cheap lousy fast food, just in a different wrapper. "In what other business can the owner or CEO shame or guilt-trip customers into giving him a tenth or more of their income EVERY WEEK by inducing fear of eternal damnation or poverty in this life - and invoking the name of God to back himself up?" Yes, but politicians are not using "God", etc., in their personal marketing campaigns to the extent that the CEO pastors use the Lords name in vain. Bruce - agreed. He did have "seed" money. He was helped by the SBC. Excellent point you make. However, compared to 2nd and 3rd generation mega super stars who take over a church from a big name pastor, Furtick DID build it from zero. How many Furtick wannabes are out there who don't get off the ground or just have a modest sized church of 50 or 100? Furtick is the Bill Gates...he made it big, and in his mind, and the mind of his followers, he deserves every penny he gets and more. I'm thinking of more Breaking Bad comparisons - the "blue" crystals and how others tried to copy it...the Heisenberg brand, etc. etc....maybe there's more to be said! "I figured if more people knew, they would do something." Nail on the head. Heart of the problem. 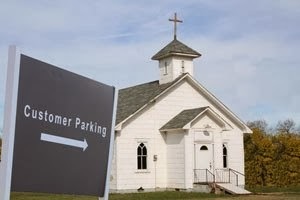 The experience at my former church was similar. People knew things, saw things, heard things, and in some cases were even told they weren't needed any longer (talking volunteers here) - and they STILL DID NOTHING. They just shrugged their shoulders and kept on coming back for more. It's like the Stepford syndrome has invaded the church. Programmed to take whatever comes with a smile. It's disappointing, discouraging, and the reason so many of us are done with church. Not faith, but church. Or those who question will be dismissed as haters. Or they will be labeled as "persecutors" for the greatness that God is manifesting through the magnificent pastor. Or they will be dismissed because God is doing such great things that the leadership MUST be doing everything right. Or "Troublemakers in the Church!" All excellent comments! These guys understand one thing... money. "The love of money is the root of all evil." So true. Fantastic post! Thanks for sharing that. It's time to realize though that we can't fix that which is not the Lord's. It's time to be separate and touch not the unclean thing so that the Lord will receive that which is His. The True Body of Christ. There is a fake co-opted by Satan and the real. In Revelation 18 the Lord says to come out lest we suffer the same plagues as those caught in the beast system. And so I have stood outside that camp myself. My early years learning and then praying for people there and then realizing all we can do is warn people that these systems are fit for the fires coming in the Great Day! Everybody, please pray for these men to be exposed. God will hear us, and He will answer us. If there are things hidden, please pray that God will bring them to light. We can't allow these pastors to get away with what they try to get away with. And how is this guy ANY different than Brunson, Jeffress, both Ed Youngs, et al.??? They're all the same self-aggredizing shysters. I THINK THE LARGEST PROBLEM IN THE AMERICAN CHURCH ISNT BUSINESS MINDED, STRONG LEADERSHIP GIFTED PASTORS LEADING MOVEMENTS FOR CHRIST....BUT RATHER MEN WITH NO BUSINESS SENSE OR LEADERSHIP ABILITY PASTORING THE MAJORITY OF THE CHURCHES IN AMERICA DOING NOTHING FOR CHRIST.